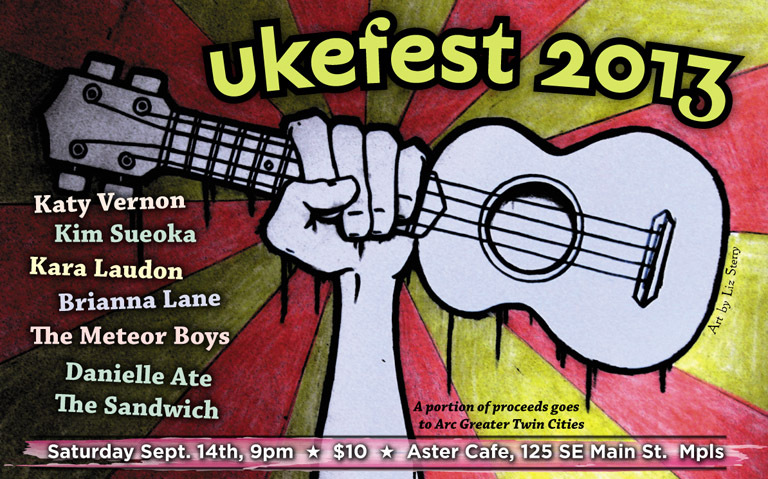 Next up a couple of smaller interesting shows around town and then UKE-FEST 2013 at the Aster, followed up by the show with Garrison Keillor!! September feels like a dream, but it’s next month folks! Here is the link for ticket and show info. Tickets on sale today at noon. I am beyond excited to announce a new show.. here are the details!!! 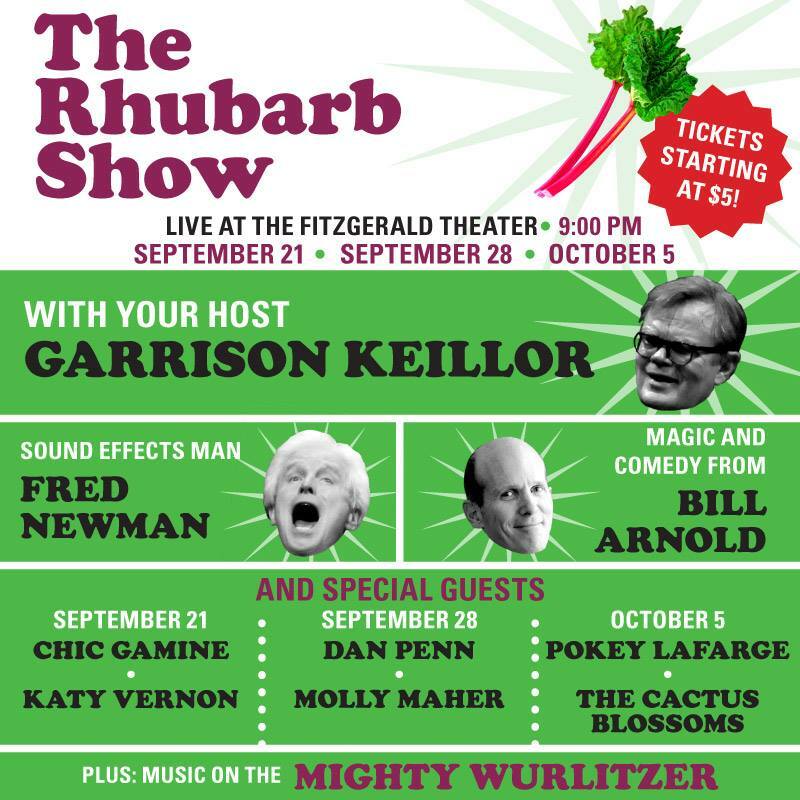 After a record sell-out of tickets for the fall season of A Prairie Home Companion, host Garrison Keillor has announced that he’s creating a new, non-broadcast variety show entitled The Rhubarb Show which will be “a club version of the radio show” and will premiere on Saturday, September 21 at 9 p.m., following the broadcast of A Prairie Home Companion at the historic Fitzgerald Theater in downtown St. Paul. Each of the shows will feature some guests from the APHC broadcast, as well as some local talent we’re excited to showcase. Sound effects wizard Fred Newman will be featured each week along with magician Bill Arnold, and musical guests include: Chic Gamine, the Canadian girl group (with a guy drummer), and Katy Vernon (September 21) and a few other surprises. Tickets for the Rhubarb Show go on sale at noon on Thursday, August 15th. Tickets categories include “Box Seats” (which include wine and desserts) $40.00; $20.00; $10.00 and $5.00. A $2.50 facility fee will be added to the price of each ticket. MPR Members receive a $2 discount on the top two tiered price categories. What an amazing day for Minnesota. I was so happy to see the joyful photos of couples getting married overnight. With that on my mind I just posted my song ‘This is it’ on my facebook page today. This is going to be my busiest month ever! I am doing my first ever ‘Residency’ at a venue. Every Wednesday in August I’ll be at the Amsterdam in St. Paul. 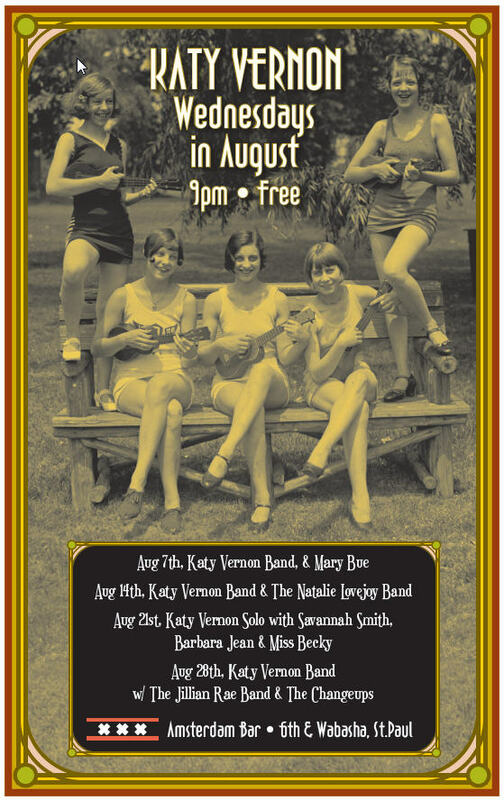 Music starts at 9pm and I’ve lined up a bunch of the most talented women I know. Before that I’ll be at Lee’s Liquor Lounge (Near the Twins stadium) this Saturday night 8/3. I have wanted to open up for The Belfast Cowboys for a couple of years, so this is a dream show for me. Music starts at 9:30 and I just found out that Terry Isachsen will be joining us (he’s on the CD and is incredible). Thank you all for your support. These gigs only keep coming because people show up, so I am grateful. Exciting August Residency dates!!!! Every Wednesday night I will host my favourite MN ladies at the Amsterdam.